sandy-brown breast; black band on lower breast; white below; yellow lappets above and in front of eyes and yellow legs diagnostic. 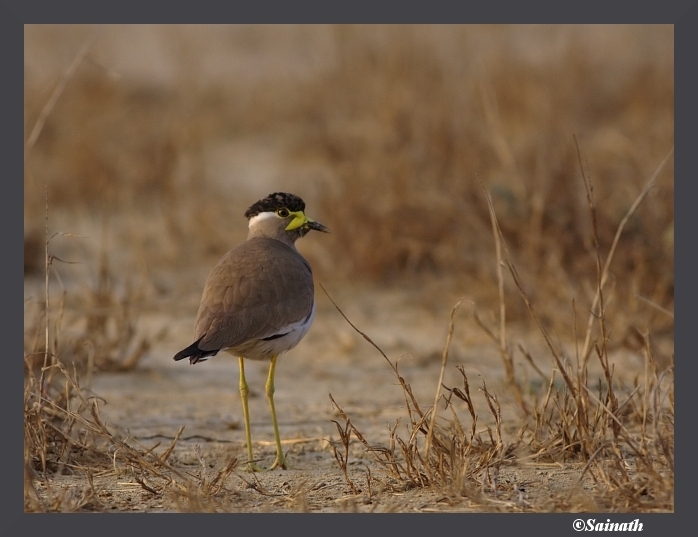 Solitary or in pairs, rarely small gatherings; sometimes with the more common Red-wattled Lapwing V. indicus; as a rule, prefers drier habitat; quiet and unobtrusive; feeds on ground, moving suspiciously. from NW India south through the area; does not occur in extreme NE. short, plaintive notes; on the whole a quiet bird; quickrepeated notes when nest site intruded upon.